Summary: Deuce Mora doesn't shy away from fights -- she picks them. The bigger the better. The grisly discovery of a human bone while Deuce is out for a hike with handsome arson investigator Mark Hearst leads to a vast burial field, a human trafficking ring, and international intrigue. The pulls-no-punches columnist—and meticulous detective--keeps turning up information, bit by bit, only to find some Fed always in her face, at her door, emerging from the shadows, steadfastly guarding the the story. Insisting it can’t be told. Yes, the Feds are aware of the trafficking ring; yes they have a plan to move on it; no, Deuce can’t be told about the plan; and under no circumstances can she write about its existence. This is the story of a lifetime—bigger than the one that earned her a Pulitzer, and, for once, she has the support of her editor. But the Journal’s lawyer appears daily, bringing warnings about “national security.” What, Deuce seethes, could be a greater matter of national security than the safety of children who are being kidnapped and murdered? And this story has become very personal for Deuce, as she herself admits. The hard-hitting journalist has fallen hard for a new guy: the savvy and charming Charles, an eight-year-old boy with the face of an angel and the possibility of a bright future--but in danger of being tarnished by a life in foster care. For Deuce, every child reported missing and every new body discovered in the hunting ground has Charles’s face. But while she’s racing to break the case wide open, her life and her career are threatened on all sides. She has to wonder if there are any lines the Feds won't cross. But break wide open it does, racing to an outrageous surprise ending that seems shockingly … plausible, and Deuce learns first-hand the lesson that sometimes the only way to accomplish a great good is to commit unthinkable evil and then learn to live with the consequences. Author Heller does a masterful job of expanding the story—and her canvas—from a simple murder mystery to an ever-widening crime thriller, and finally to an international conspiracy. Last year, I featured the novel THE SOMEDAY FILE by Jean Heller. This novel was the first in a new series starring Deuce Mora, a columnist for the Chicago journal. The book had political intrigue, some criminal elements, the Chicago mob, and lots of suspense. Ms. Heller's second novel starring Deuce Mora, THE HUNTING GROUND, is now available... and free to those of you with Kindle Unlimited! 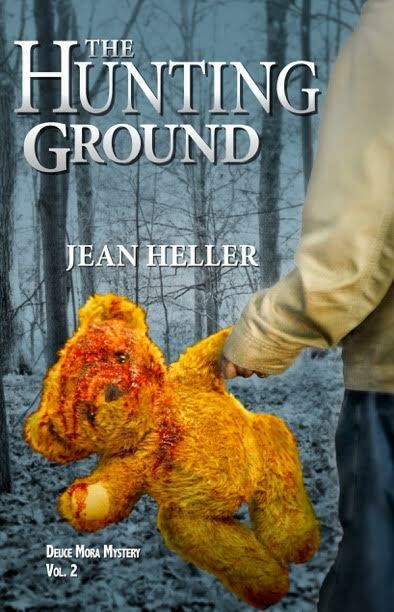 THE HUNTING GROUND sounds like a good one. Deuce is trying to get some exercise and fresh air when she makes a shocking discovery -- someone is kidnapping and murdering children. Deuce is determined to get to the bottom of this mystery, but she finds herself hitting wall after wall. The police won’t act or even talk about the crimes; and neither will the mayor, or the medical examiner, or the Department of Children and Family Services. All the organizations who should be helping the city's children seem to be helping those responsible for the crimes. These crimes become personal for Deuce as she tries to make sense of the violence. Just how far is Deuce willing to go to get to the bottom of these horrific crimes? I am excited that I have a copy of THE HUNTING GROUND to share with one lucky reader courtesy of the author and Saichek Publicity. To enter, just fill out the form below before January 23rd at 11:59 p.m. EST. I will randomly select and notify the winner the following day. This contest is open to those of you with U.S. addresses only. Good luck!